Today we learned about the Japanese particle も (mo). We learned that も is similar to the English words “too” or “also.” In this review we will go over the concepts from the video and see some more examples and uses. ★　The Japanese particle も means also or too. ★　私も! (Watashi mo!) means Me too! ★　To make it more formal, just add です (desu) to the end! watashi wa inu ga suki desu. watashi mo inu ga suki desu. ★　By replacing the particle は (wa) from the first sentence with the particle も (mo), it gives the meaning of too. watashi wa inu mo neko mo suki desu. 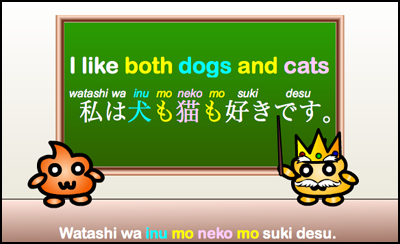 ★　This means that I like both dogs and cats equally, without any preference for one over the other. Watashi wa niku mo yasai mo suki desu. I like both meat and vegetables (equally). Anata mo Amerikajin desu ka? Kōhī ga suki desu. Ocha mo suki desu. I like coffee. I also like tea. I like both dogs and cats (equally). Is it possible to just say お茶も好き and leave out the です ? Also, would just saying お茶も work too, since in the first sentence you already established that you were talking about things you liked? If I wanted to say “he likes dogs” could I say “かれは犬がすきです” ? Is that correct? Or is there a better way to list three or more things in this way? Does ‘watashi wa okaasan to kohi mo ga suki desu,’ make sense? If not, how would I say it? Is the sentence アメリカに行っても grammatically correct. It’s not a complete sentence. (◕ω◕)☆ It roughly translates to: “Even if (you) went to America…” It sounds like something should come after this. What did you want to say? If I only want to answer with “Me too”, can I just say “Watashi mo”? For example if someone says “Neko ga suki desu” and I want to say “Me too” is it grammatically correct to say “Watashi mo”? ジョンもキムもいる。 – Both John and Kim are there/here. ジョンとキムもいる。 – John and Kim are there/here. I guess using two も’s makes it more emphasized that they are both there. Why does the sentence sometimes have か and sometimes が? Is it because it’s plural? Which sentence are you talking about? I am not sure where you are having confusion. か and が are both particles, but their function is very different. It has nothing to do with anything being plural (there is no plural tense in Japanese). The particle か can be used at the end of a sentence to mark it as a question. 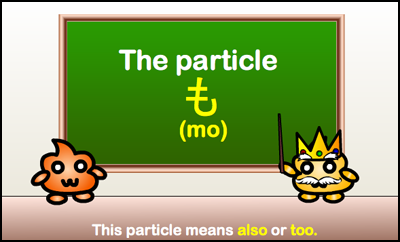 The particle が can be used to mark the subject of the sentence. I notice that some sentences have a が and other sentences don’t. When stating one interest, it has a が and when stating multiple interest it doesn’t have a が. 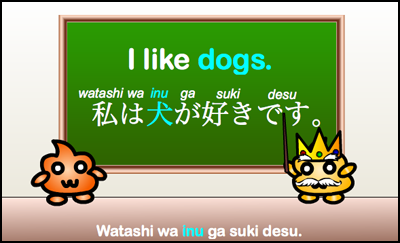 Is the reason why this sentence have a が “watashi mo inu ga suki desu.”, have to deal with keeping a particular between the verb and noun? Another example of this is if you said: “Neko ga suki desu. Inu mo suki desu.” (“I like cats. 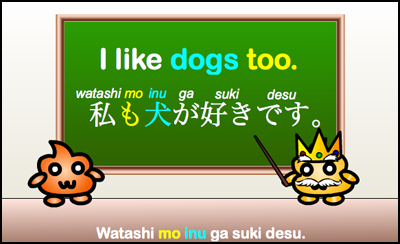 I also like dogs.”) In sentences where you use the particle “mo” after the subject (in this case “inu” (dogs) is the subject), the particle “ga” is omitted. Does this make sense? “ga” is the subject marking particle, but it can be replaced by the particle “mo” in some sentences. They will never be used alongside (inu ga mo suki desu).